The Anamoose VFW auxiliary had their annual cancer fund-raiser today with a rummage, craft, bake sale & lunch. Pictured is the Senior Citizen’s quilt that is being raffled off. Second prize is a jacket & 3rd, 4th, 5th, & 6th prizes are table runners. On the right side of the table are the Anamoose Heritage cookbooks sold by MainStreams LLC. The cookbook has over 300 recipes of residents from Anamoose & nearby towns, family members, & alumni. The books are for sale for $15 & can be purchased at 1st State Bank & KB’s Bar. This military quilt was not for sale. 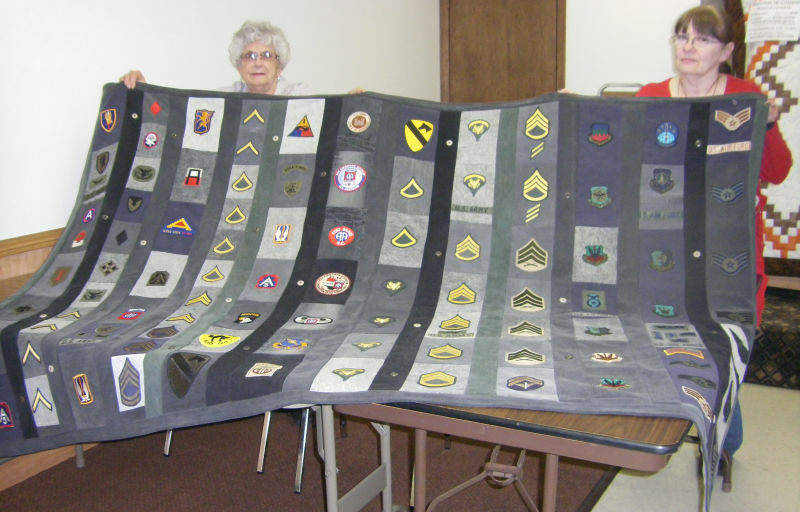 Barb Nolden (Anamoose alumni) was showing her quilt that has rank & military patches. She will be giving it to her sister Jackie’s grandson, Joe Toth. It has patches from her brothers & other family members. Several served in Viet Nam & Iraq. The center row is Joe’s patches except the top patch was his dad’s-Chris Toth. Pictured are (left) Janice Buchholz & Barb Nolden (quilter) holding up the quilt.